I make these frames every year, and for most of the holidays. Simply by changing out the paper, or fabric, and letters. I have done I heart U, Hop, USA, Boo, Joy, etc. 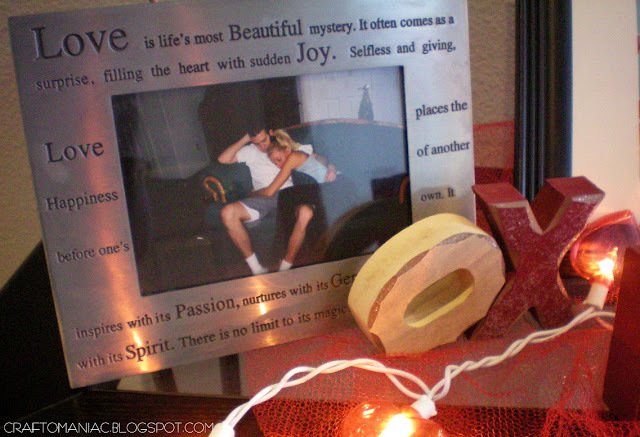 Its a super easy inexpensive DIY craft you can do for the holidays. The black frame is from Walmart for 3.00 dollars. The letters I cut out from my cricut. I even used a glue stick to attach them to the thin fabric. THATS ALL. The love blocks I purchased years ago, but would be cute to duplicate right? 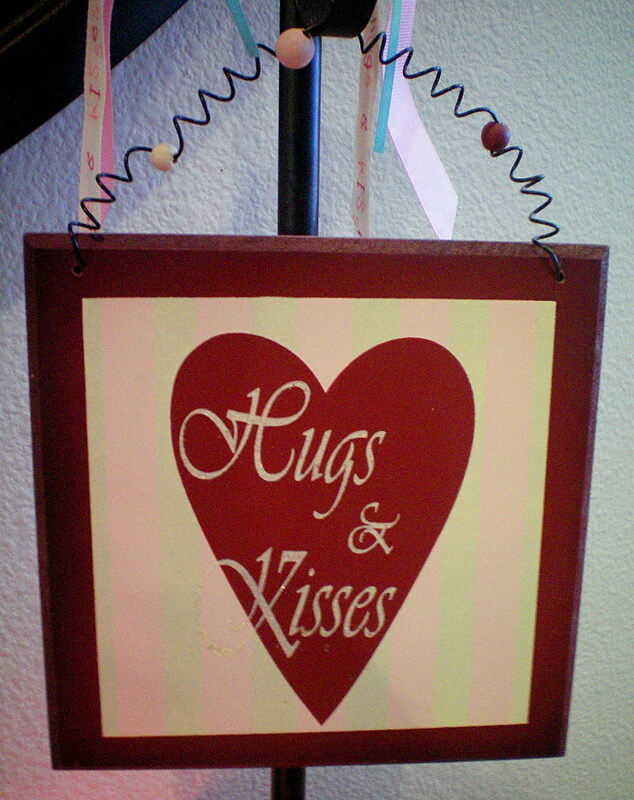 the hanging hugs and kisses sign I too bought, but again would be easy to make. Because its a “LOVE” table. 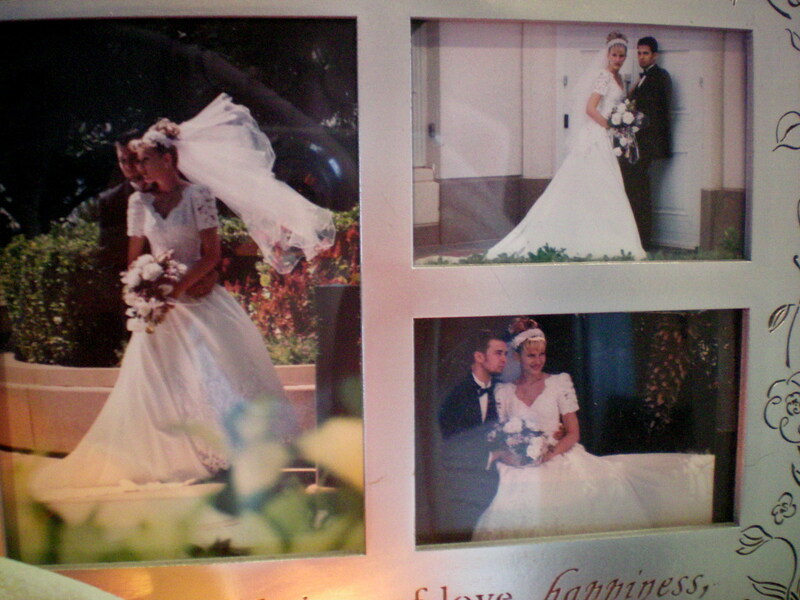 It made sense to put a picture frame of mine and Mr. Larsens wedding day, and another my mom took of the two of us asleep on her couch when we were dating. This Sept. will make 12 years. “WOW” and truly I CAN honestly say I love him way more now then I ever did. It really does get better. No I am not that skinny anymore… I would have to starve for a year to be a “4” again! I love the sound of his beating heart. Even to this day, if I can’t sleep I cuddle up to him and the sound of his heart always relaxes me. 😉 The “XO” blocks I bought years ago, but wouldn’t they be cute to make? 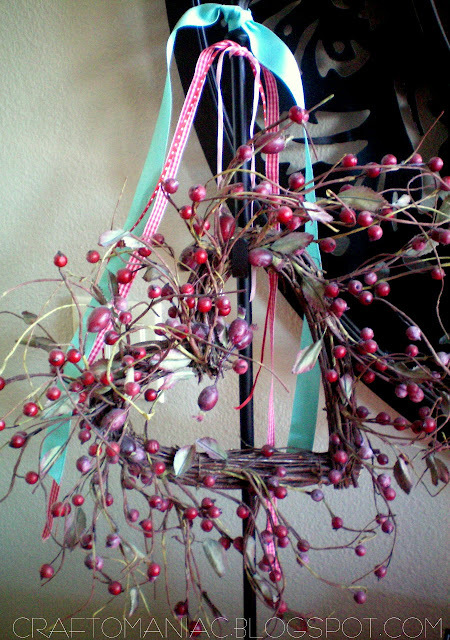 I purchased this heart berry wreath years ago. Most the red berries look faded, but I still “HEART” it! I am linking up with C.R.A.F.T. for Making Monday Marvelous HERE and Stories of A-Z for Beth’s Valentine Mantel Party HERE. Super cute! I love the the HUG frame. I want to make one! You are going crazy with the Valentines crafts:) You are so talented! Love your blog. My kids went back today- it was so nice! 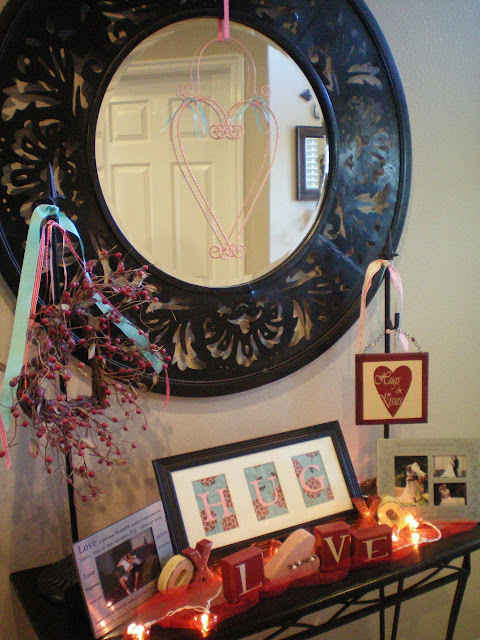 What sweet pics of you & your hubby and a very cute Valentine’s display. I love that frame that the couch picture is in! Congratulations on 12 years! Amazing as usual!!! It looks so adorable!!! I love it no punn intended!! So cute Jenn. I love your little table vignette! What a great table! So festive. I love it! Such a cute & festive display! 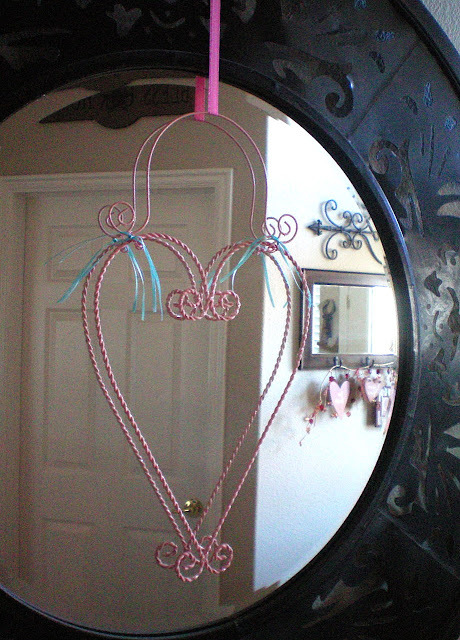 Makes me want to start making some V-Day decor for my house. DARLING! 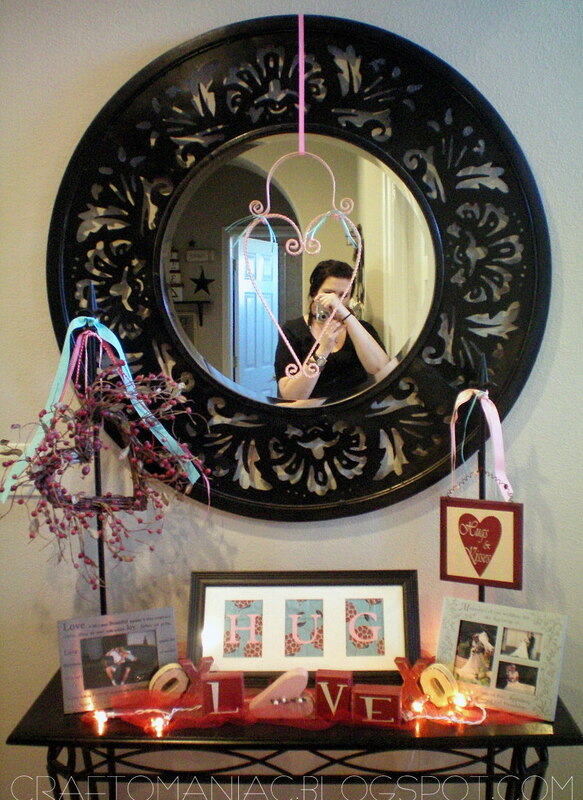 I just found your blog, and I’m loving the valentine’s decor all over. You are inspiring me to get crafting! GIRL, you are always so on top of things. I’m still dranging out the Christmas stuff I barfed out. I need to get it done already! SO, I do have Krumpets spray. MY FAVORITE. My in-laws live in SU and we visit often. Thank goodness…where else would I find such yummy smellin’ stuff? I would die without my spray! Thanks for inspiring me to get my stuff done! SmoOcHes! Love it all, as usual! Great job! 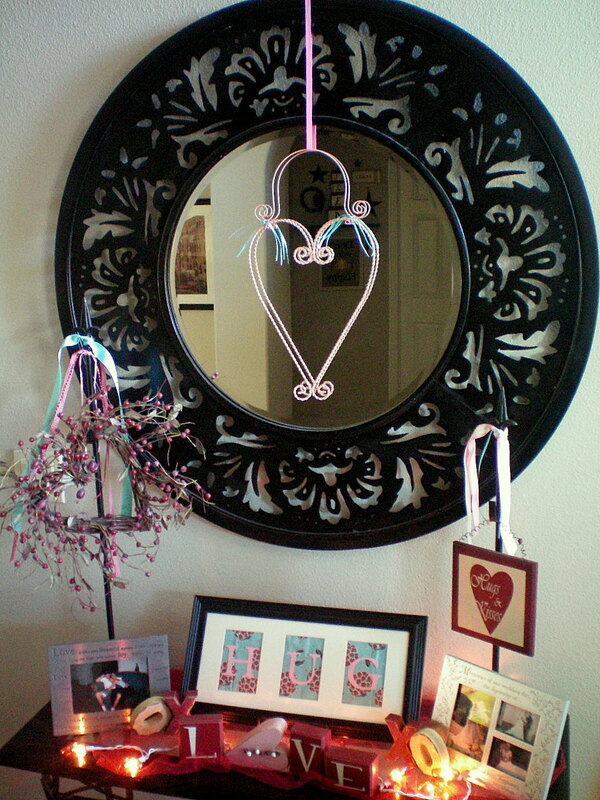 You do inspire, I know you’ve certainly inspired me to get going on the V-day crafts – like someone else said. Love the frame idea – I intend to steal it! 🙂 Thanks for all the cute ideas. I am really enjoying your stuff! Love it! I’m super jealous your Christmas decor is already packed away…I still have the tree to put away. That is my goal today though! Looks great! I think I have a frame like that somewhere. Hi!! This is way cute!! 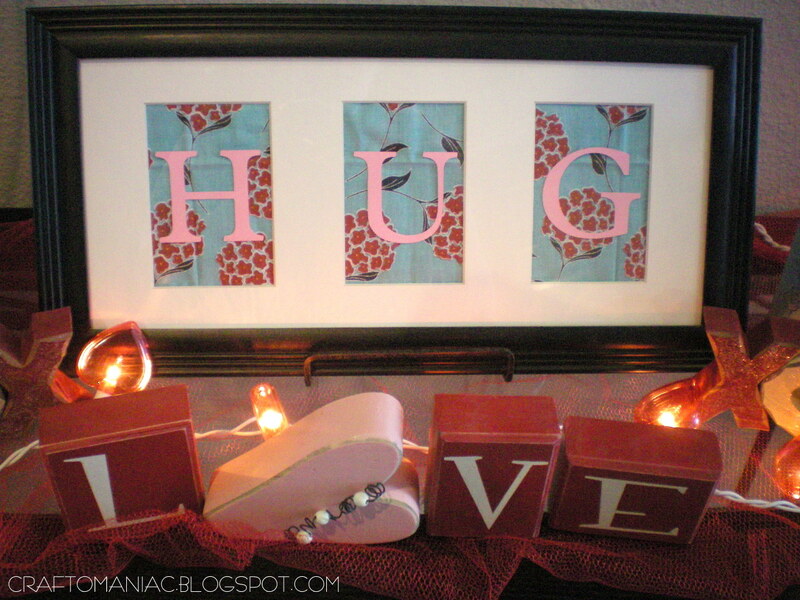 I am highlighting you on my top 10 V-day crafts thus far! You are and always have been (apparently) gorgeous! Too cute! 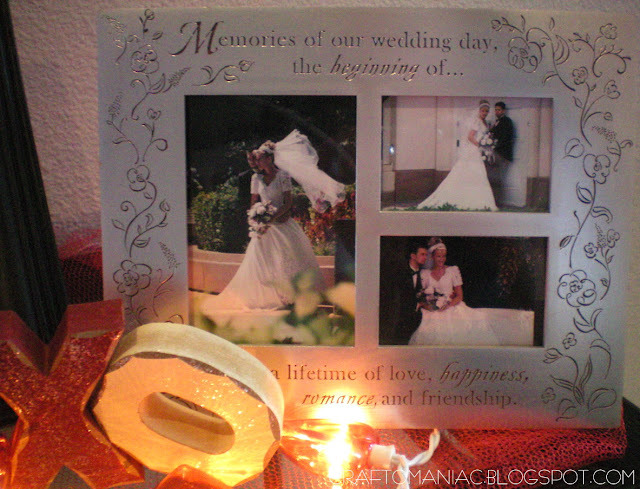 Love the tables, and the picture frame is always done up so cute! Ok, so I am so inspired by your HUGS frame.I took mine off the wall (of the kiddies) and took it apart and just spray painted it black (just now I did this)…when it drys…I will find some paper and put behind the mat…only 1 problem..dont own a circuit machine…so I will have to print and cut out..either way…thanks for the inspiration! Nice Valentine’s Day decor! I heart it! Oh how precious! I just adore the tiny heart wreath. You always create such precious vignettes for your adorable family to admire and cherish. We sold our old stuff Jenn. Hooray! I’m so excited. Check back to see my new sofas soon. That is so sweet. Love all the photos. Very pretty! I am still putting away Christmas!! Fabulous ideas! I love the ‘hug’ frame. I just recently recieved one as a gift..now I know what to do with it! So cute! 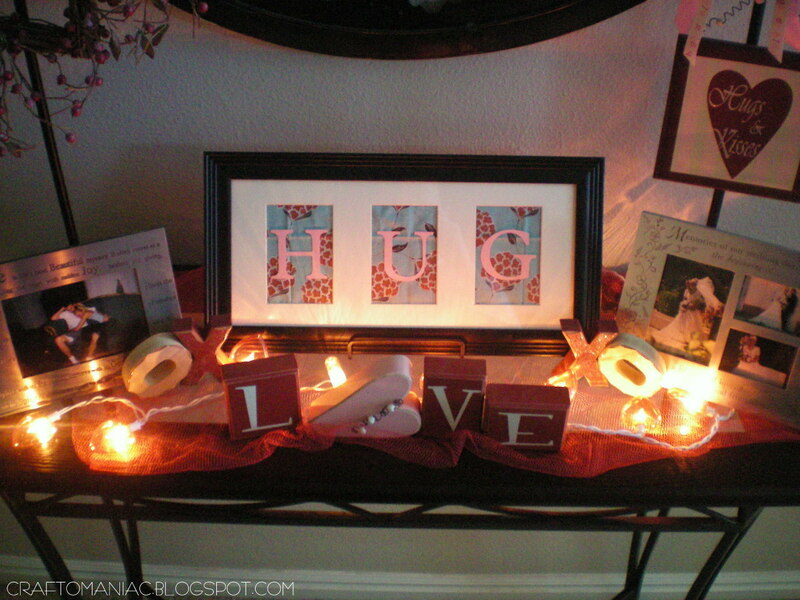 I just did a V-day entrance table myself. I love the “HUG” art!